before 6:00 this morning. The weather was good but the wind was supposed to come up and within an hour, it definitely came up. We were prepared though and only had minor things fall all over the boat. The anchor, though (of course!) got loose – not too badly – and Dennis had to go up forward to fix it. Luckily this happened earlier in the day when the waves weren’t so huge. We motored the whole way into the wind, so it was not a good day for being too productive. Dennis steered most of the way while I fiddled with the transister radio until I found the CBC. I perked up when Jian Gomeshi came on. Later on in the day, I setup the satellite radio and I am ever glad we have that! The CBC was crystal clear and we got to listen to Jian again! I also forced Dennis to listen to Wiretap (one of my favourite shows). Needless to say, he sped up the boat in hopes of either drowning Jonathan Goldstein out or so that we would arrive earlier and he wouldn’t have to listen to him. We are in Wingfield Basin – all secure. It is a very nice and quiet anchorage and there are a few boats here but not too many. 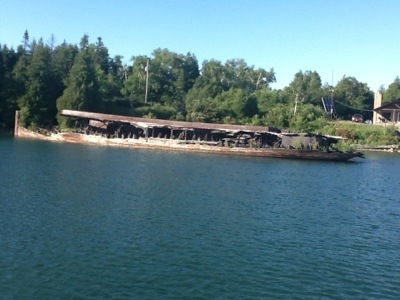 We are in the prime location – right beside the wreck! 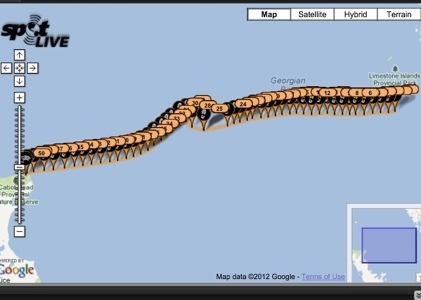 I have included a picture of our track and as you can see, there is a fairly straight line for most of the trip. The strange angle though is when it was getting too rough and Dennis thought it would be better to not have boat going directly into the waves. We are now getting ready to head out to Tobermory. Well, I am trying out publishing using the iPad so please excuse the pictures – I wanted to see where they would fit in. We stayed on the boat last night at Bob’s Point Marina even though it was a Thursday and I had to work today. It was nice though, I walked to work and back to the boat. Got lots of exercise so that was good. 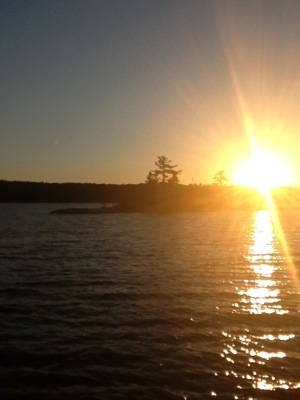 We headed out after school at around 4:00 and are now anchored at Killbear Park. It is very quiet – only two boats in the anchorage. We went for a swim but it was very cold. The water is only 19 degrees which is very refreshing. Now we are just hanging out in the cockpit watching the sun go down. Dennis is actually using the iPad. Who knows? Maybe I’ll get him hooked on it and then we won’t have to bring his computer when we go for the summer. Tomorrow we are off to the back side of Regatta Bay. We’ve never been to this anchorage but the water is so low, we can’t get into the regular anchorage. Too bad because I wanted to see if the giant turtle made it through the winter. Uncovering The Split Crow – Happy Easter! Check out the trees in the background - early spring, so it will be a while before the boat is launched. 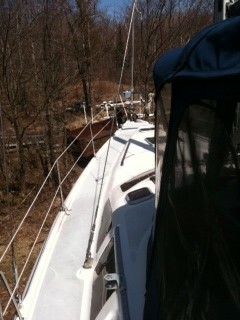 So, the weather has been quite cooperative this spring and yesterday, Dennis drove out to the boat to uncover it. I rode my bike out (42 km) and managed to arrive just as he was finishing so that was very good timing on my part! The only thing I had to do was help fold up the tarps, so that was great! We aren’t actually putting the boat in the water until the May long weekend. It is way in the back of the yard at Killbear Marina, so it will be one of the last to go in the water. We’re in no rush though, since we really can’t go anywhere until June 29th when I am finished work. The boat is in good shape – there’s not much to buy except for some cockpit cushions and I emailed HunterOwners.com regarding those, so hopefully we’ll get them in the next few weeks. 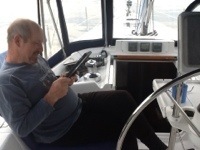 We have to order a split cable for shore power – for the air conditioning. I know that sounds spoiled but we will be in southern Ontario for most of the summer where the temperature is often in the upper 30s for days on end – not to mention the humidity! 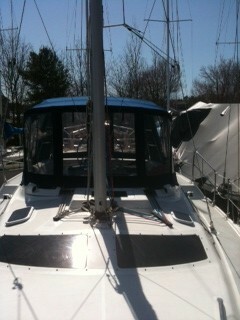 So, if nothing else, at least we’ll be comfortable at night as we will be spending most of our time at marinas. Next summer will be totally different since we’ll be on the St. Lawrence (we hope to get as far as Quebec City this summer) and apparently it is often cold and foggy on the Gaspe. Anyway, things are progressing as planned and we are looking forward to summer. I did check the Nexus wind instrument and it is actually working still! That’s a sign that things are looking up!